At least 37 people have been killed after a cargo plane belonging to Turkish MyCargo Airlines crashed into a residential neighborhood near Kyrgyzstan’s capital of Bishkek. Among those killed were four crewmembers, all Turkish nationals, said Deputy Prime Minister Muhammetkaly Abulgaziev. 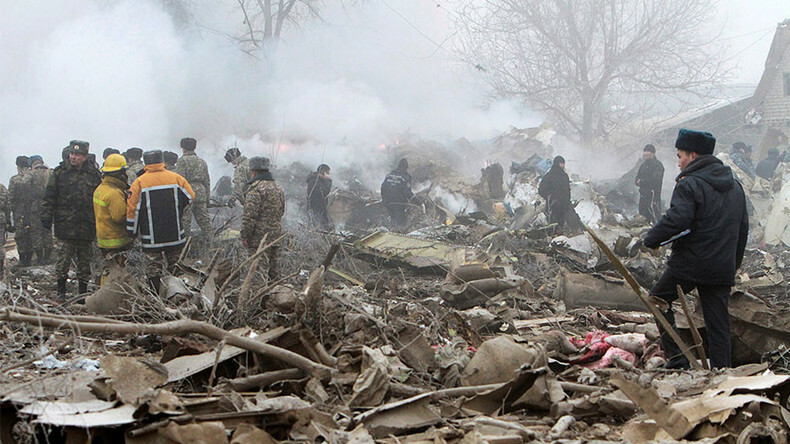 Abulgaziev added that the recovery workers have found the black box from the crashed jet. One of the pilots died at the scene of the accident, Kyrgyz Health Ministry spokeswoman Elena Bayalinova said. The aircraft was operating the flight route TK6491 from Hong Kong to Bishkek, and would have flown on to Istanbul. — Boarding | بوردينج (@BoardingAV) 16 января 2017 г.
Kyrgyzstan's Emergencies Ministry said the plane crashed in a residential neighborhood outside the capital, Bishkek. The plane crashed 1.5 to 2km from the runway, a source in the Kyrgyz Transport Ministry told Interfax. At least 32 residential buildings have been destroyed in the crash, the government press service of Kyrgyzstan said, as cited by RIA Novosti. Firefighters are at the scene, the ministry added, as cited by TASS. All flights to and from Kyrgyzstan’s Manas airport have been suspended until further notice, RIA Novosti reported, citing local sources. Kyrgyz PM Sooronbay Jeenbekov has arrived at the crash site, the government's press service told RIA Novosti. Bishkek resident Zumriyat Rezahanova told RT that her cousin’s house was the first to be hit by the plane. “Her house was the first. The roof was blown away,” said Rezahanova, adding that the local residents heard a strong boom, and those who were in the house thought it was an earthquake. One of the deadliest airplane accidents in a residential area occurred in 1997, when a Russian An-124 airplane crashed in a residential area near the city of Irkutsk in Siberia shortly after taking off. Seventy-two people were killed, including 49 on the ground. In 2001, American Airlines Flight 587 crashed into a Queens neighborhood in New York City, killing 265 people, including five on the ground. In 2015, an Indonesian Air Force jet crashed near a residential neighborhood shortly after taking off from the Indonesian city of Medan. All 121 people on board were killed, along with 22 people on the ground.